Identification: Upperside is light yellow-gray. 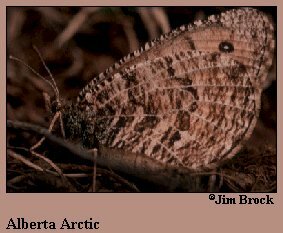 Underside is light brown; forewing has a postmedian line bent sharply at the end of the cell; hindwing has a sharp-edged dark median band. Life History: Males perch and patrol all day on bunchgrass-covered slopes. Caterpillars probably hibernate in their fourth stage. Caterpillar Hosts: Bunchgrass, possibly Festuca. Habitat: Virgin prairie, dry bunchgrass hills. Range: Canadian prairie provinces east to southern Manitoba. Isolated populations along the Rocky Mountains in Colorado, New Mexico, and Arizona.